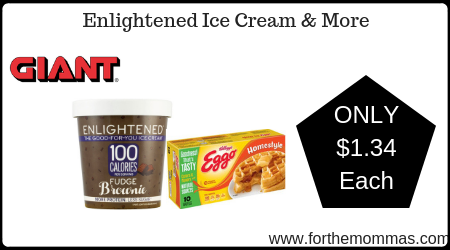 Giant: Enlightened Ice Cream & More Just $1.34 Each Starting 3/22! We have a great deal to make savings at Giant. Enlightened Ice Creams and Kellogg’s Eggo’s Waffles are priced at $4.00 each and $2.50 each. In addition to this price you will save $5.00 off instantly. Plus we have a Enlightened product printable coupons to use on this deal that will further reduce the price. sack it with an Ibotta rebate that will make the final price just $1.34 each!